"Ideal weight" does not mean having an ideal body -- almost everyone has physical features they would like to change. Rather, ideal weight is a medical term that refers to how much you should weigh, based on your height, gender, and age. Doctors use a few different methods to determine whether you are overweight. The main approaches are measurements of your body mass index (BMI), your waist circumference, and your waist-to-hip ratio. A healthy BMI for an adult generally falls between 18.5 and 25. If your BMI is over 25, you are probably overweight. If it is 30 or higher, you are considered obese, and 40 or higher, extremely obese. Body builders: Since muscle weighs more than fat, people who are unusually muscular may have a high BMI. Elderly: In the elderly it is often better to have a BMI between 25 and 27, rather than under 25. If you are older than 65, for example, a slightly higher BMI may help protect you from osteoporosis. Children: While an alarming number of children are obese, do not use this BMI calculator for evaluating a child. Talk to your child's doctor about what an appropriate weight is for his or her age. Your waist circumference indicates how much fat is collected around your midsection. Doctors aren't sure why, but fat around your middle (called central obesity) is more dangerous than fat around other parts of the body, like your hips. People who have a high waist circumference and a high waist-to-hip ratio are more at risk for many diseases associated with being overweight, particularly heart disease and diabetes. 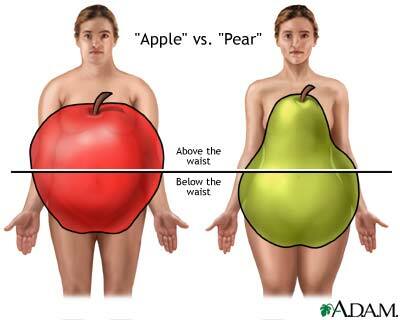 Weight gain in the area of the waist and above (apple type) is more dangerous than weight gained around the hips and flank area (pear type). Fat cells in the upper body have different qualities than those found in hips and thighs. To measure your waist circumference: Wrap a tape measure around your middle at the level of your belly button. The risk of heart disease and diabetes increases if your waist circumference is more than 35 inches (88 cm) for a woman and more than 40 inches (102 cm) for a man. You should strive for a waist size less than 31.5 inches if you are a woman and less than 37 inches if you are a man. To measure your waist-to-hip ratio: Measure your hip circumference at the level of the two bony prominences felt in the front of your hips. Then, divide your waist circumference by your hip circumference. Your waist-to-hip ratio should be below 0.8 for a woman and below 1.0 for a man. Remember: Some people don't need to lose weight! In our culture of thinness, some people strive to lose weight when they don't need to, or they strive to lose more weight than they should. Besides the obvious dangers of anorexia and bulimia, being underweight can cause bone loss, low blood pressure, and other extremely serious problems. Before you decide to lose weight, assess yourself honestly. Do you really need to lose weight? Do others express surprise or concern that you are considering weight loss? Do you have expectations for weight loss that go beyond improving your health? If any of these apply to you, a professional counselor may be appropriate to help with body image issues.